Owning a car for many Ethiopians - even those with ready cash to spend in one of the world's fastest-growing economies - remains a pipe dream. "I have been saving for nearly four years now, and I still can't afford to buy even the cheapest vehicle here," a frustrated Girma Desalegn tells me. He has been shopping around for a whole week in capital, Addis Ababa, and has still not found an affordable car. He is looking to buy a second-hand car imported from the Gulf states or Europe - but even they are prohibitively expensive because the government classifies cars as luxury goods. This means even if a vehicle is second hand, it will be hit with import taxes of up to 200%. "I have a budget of $15,000 (£12,300) and had expected that with that I could buy a decent family car. "I don't want to buy the Toyota Vitz," he says pointing to a row of small hatchbacks that have now become popular on Ethiopian roads. These cost about $16,000 in Ethiopia; in neighbouring Kenya the same car costs not more than $8,000. It seems little wonder that Ethiopia has the world's lowest rate of car ownership, with only two cars per 1,000 inhabitants, according to a 2014 Deloitte report. 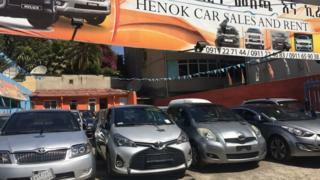 Henok Demessew, who has been running a car import and sales business in the capital, blames taxation. "If it was not for that, we would have been able to import better cars either from Europe or America. But in order to make any profits we have to sell cars at such high prices. "On top of the cost of shipping the cars from say from Dubai via Djibouti, we have to deal with multiple taxes to the government, making this one of the toughest businesses to be in, even though it's seen as lucrative." The Ethiopian Revenues and Customs Authority says both commercial and private vehicles imported into the country can be subjected to five different types of taxes. However, despite the heavy tax burden there is a rise in the numbers of car imports. In 2016, government records show that 110,000 cars were imported to Ethiopia, an increase of more than 50% on the previous two years. Kasaye Ayele, a tariff officer at the customs authority, says there is some discretion. "Vehicles that are imported to be used for public transport - we collect a much lower tax of 10% and not all five taxes are applied," he explains. "But for private cars we check the engine capacity and if the capacity is big, we collect anything between 60% and 100% [of taxes due]." Once all taxes are added to an imported car's price tag, it could cost nearly three times more than the retail price in its country of origin. But Mr Kasaye defends the taxation policy, saying it was fair and staggered. He cites examples of discounts given for buying second-hand cars. In a bid to encourage people to buy cheaper, locally made cars, the Ethiopian government has given incentives such as tax breaks to foreign car manufacturers to set up and assemble new vehicles in the country. Currently Ethiopia produces 8,000 commercial and private vehicles for the local market a year - something the government admits is way below the country's potential. Prime Minister Hailemariam Desalegn has often pointed out plans for Ethiopia to become a leading manufacturer and exporter of locally made cars. At least half a dozen car assembly plants, mostly Chinese, have been set up in Ethiopia. One of them is Lifan Motors, which was set up nearly seven years ago. One of its cheapest saloon models costs about $20,000 new. It has a plant on the outskirts of the Addis Ababa which assembles about 1,000 cars a year - way below its capacity. For the company's deputy manager, Ma Qun, this is down to a lack of confidence in the local market from consumers. Those who can afford imported brands, will choose them over local cars - despite the high taxes charged on used cars, he says. "We are not satisfied. Our factory's capacity is about 5,000 a year but we sell just 1,000 units. "It's because the policy doesn't restrict second-hand cars. So there aren't really many incentives for us to compete. "We are waiting to see if there will be a change in the policy." For many Ethiopian car buyers it comes down to value for money. "We often prefer imported cars because we believe they are much better than the Chinese assembled here," one prospective buyer said. "On top of that, people don't trust cars assembled locally because what we import from China are not up to a standard quality." Another pointed out concerns about spare parts for locally assembled cars. "Those you usually find around here are not genuine. That is the major reason people prefer Japanese cars." But the government is highly unlikely to change its luxury tax on foreign cars. So for people like Mr Girma, who wants a big, reliable car for his family, it remains a Catch-22 situation and his search will continue.